A Mining Training Centre will be established in Northeast Arnhem Land with $2.4 million in support from Rio Tinto, the Gumatj Corporation Ltd announced today. The new centre will provide training for Yolngu people and is an important step towards the creation of a bauxite mining operation to be run by the Gumatj clan at Dhupuma Plateau. 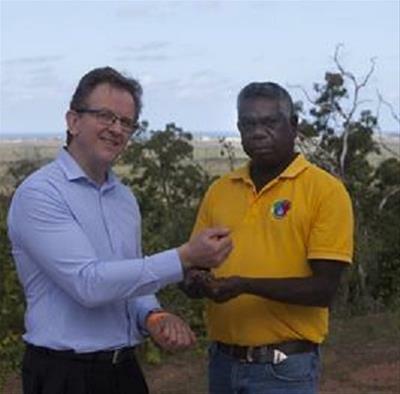 “Our aim is to create a sustainable, Indigenous-owned business that will deliver long-term economic benefits for the Yolngu people,” Gumatj Deputy Chairman Djawa Yunupingu said. "This training centre will help Yolngu develop the skills to work in mines across the Northern Territory, through on-the-job training within Gumatj mining operations. It will be available to Aboriginal people throughout the Northern Territory who wish to learn skills in the mining industry. “With the support of Rio Tinto, we are making considerable progress towards this mining operation. The Gulkula Mining Company has now submitted its Exploration Licence and Mine Management Plan, with an exploration program starting next month to prove up the quantity and quality of the reserves." Construction on the Mining Training Centre is expected to start in the coming year at a site near the new Garma Knowledge Centre in Gulkula. It will link in with the Foundational Learning programs being developed by the Yothu Yindi Foundation. Rio Tinto managing director Australia Phil Edmands said Rio Tinto was pleased to strengthen its partnership with the Yolngu people. “Rio Tinto will continue to be a part of the Northeast Arnhem Land community into the future through its bauxite mine at Gove,” he said. “We believe this training centre will be an important catalyst for Yolngu people across the region to develop the life-skills and training needed to establish successful careers in the mining industry. "We are working to increase the level of Indigenous participation in the workforce at our Gove bauxite mine, and we hope to see the training centre play a role in achieving this outcome. "This is a project being driven by Yolngu people to shape their own futures, and we are proud to be able to support them in this endeavour." The announcement of the training centre follows the opening of the new Garma Knowledge Centre at Gulkula yesterday. The Centre was developed by the Gumatj Corporation Ltd with support from the Commonwealth Government and Rio Tinto.